Don’t you love new beginnings? Nothing better than a fresh start, and a turn of the year is about as fresh as it gets. 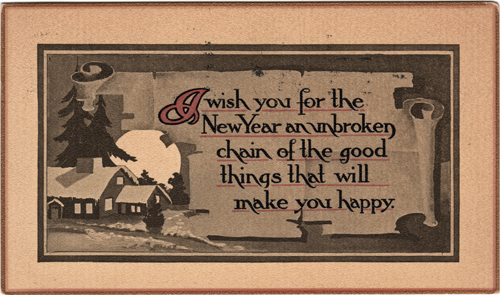 I found some treasures in my vintage postcard collection to help you celebrate the first new day of 2013. 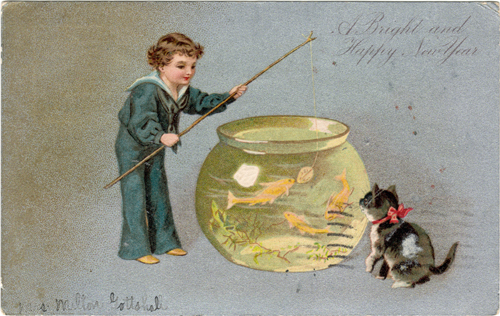 Miss Jennie Bouman of Niantic PA received this card from her friend Mrs. Milton Gotshall of Boyertown PA on December 31, 1906. I love the girl with her little sailor suit, and the enthralled kitty with its merry red bow. And so to you the same, although you are not here in person, I thank you all for visiting my blog this past year, and wish you a very very Happy New Year, and an “unbroken chain of the good things that will make you happy”! 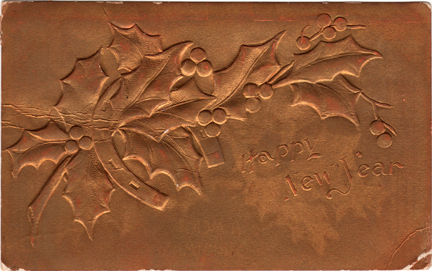 This entry was posted in Vintage cards and tagged Happy New Year, holiday postcard, postcard, vintage holiday postcard, vintage postcard. These are so sweet. I have a file of Vintage sewing machine ads. The graphic of that day are so simple and touch my heart. Thanks for this.